This mountain is crowned by the statue of Christ the Redeemer, 30 meter high with a 8 meter pedestal with a chapel to honor our Lady of Aparecida, patron Saint of Brazil. This is one of the main scenic spots in the city, located at the Tijuca National Park, 710 meters high and giving a sweeping panoramic of sea and mountain, a world famous vista.The imposing statue of Christ the Redeemer atop the Corcovado embraces the city of Rio. Corcovado or Hunchback Mountain is so named because of its shape. It offers a magnificent view of Rio’s beaches, Sugarloaf, the Guanabara Bay, Botafogo, Flamengo and much more. Corcovado is accessible by car or train. The best way is to hire a taxi and fix a rate with the driver so that you have time to stop along the way to enjoy the impressive scenery. 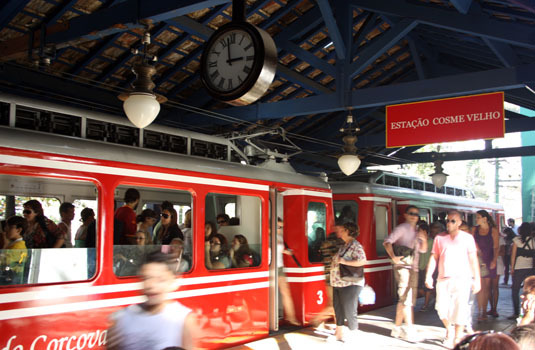 Many tourists prefer the rack railway that departs from Cosme Velho 513 to Corcovado. You can get there by bus from downtown Rio by Bus #180 or #184. If you are coming in from Copacabana or Ipanema, bus #583, takes you to Cosme Velho. A miniature electric train chugs its way on a journey through the Tijuca Forest from Cosme Velho to the foot of the statue. You will enjoy this ride that offers a stunning view of Rio including the Tijuca Forest, spread out beneath the statute. Grab a seat on the right side of the compartment for the best view. If you wish to go by car then you can stop at the Emperor and the Dona Marta observation decks along the way and enjoy the scenery from these vantage points. Train rides are from 8:30 am to 18:30 leaving every half hour, Monday to Sunday. Timings can suffer changes, so it is advised to check before you go. Make sure you head out early on a clear day so that your view isn’t restricted by the clouds or smog that develops over Rio. Even if you aren’t the religious type, Corcovado is one place you cannot afford to miss. Go there once and you will find yourself coming back time and again. Animal lovers don’t forget to take some extra bananas along to feed the monkeys.